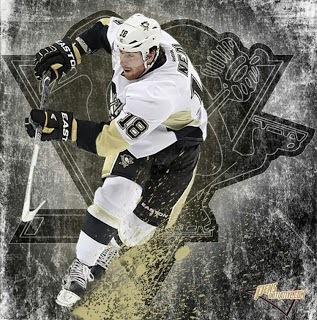 After evolving into one of the league's premier sharpshooters upon his arrival in Pittsburgh, James Neal figured to compile a monster 2013-'14 season. As the campaign commenced, though, things quickly derailed for Neal. An injury sidelined the winger for all but a handful of shifts on opening night and subsequently kept him out of the lineup for the next 15 contests. Upon Neal's return, though, he went on a tear. In only 20 games, "The Real Deal" compiled an astounding 14 goals and 30 points, closing out 2013 as one of hockey's hottest players. Despite missing over a month of action, Neal wasted little time in ascending the list of NHL scoring leaders. A new year, however, exposed the streakiness of Neal's game. Because, in his last 19 contests, the sniper has endured goal droughts of both eight and six games, the latter of which represents a current slump. Between that lack of production, though? A career-high five-game goal scoring streak. So, what does it mean? Well, if history is any indication, it could mean James Neal finds himself on the verge of a scoring surge. Over the course of his first two full seasons in Western Pennsylvania, Neal experienced three significant scoring slumps: one six-game and two nine-game droughts. He followed those up, however, with six goals in his next seven games, five markers in the following five contests and four tallies in five outings. Clearly, he's made a habit of busting out of dry spells in a big way. As a result, it's likely only be a matter of time before Neal starts, once again, lighting the lamp with the best of them. Does that mean Neal will break out of his slump tonight in Detroit? Not necessarily. But don't be surprised if The Real Deal heats up in the next couple games. Because, more often than not, Neal follows up a drought by pouring pucks in the opposition's net. In the end, it's just a matter of breaking through.